It’s fall, our favorite season! To celebrate, we’re bulking up our catalog with 42 new tuxes. We are also giving you the new ability to buy (instead of rent) many of our formalwear accessories, and announcing several new features that we have quietly added to our store over the past few weeks! So let’s break it down, shall we? Oh yes, we are bringing you 42 new tuxedo styles, across all 4 of our pricing tiers, from 9 different formalwear designers. This nearly doubles our original selection. We now have a total of 88 Tuxedo Styles! There are new colors, there are new categories and styles that weren’t available before. This is one of the most important updates we’ve made to our catalog since we’ve been in business. We are bringing you 42 tuxedos, made by 9 different designers. This is particularly worth mentioning because we have one new designer in our catalog: Michael Kors. We are very proud to bring 2 fantastic tuxedo collections from Michael Kors: the Desire tuxedo and the Obsession tuxedo are both available through our rental tuxedo builder. We feel it’s also appropriate to remind everyone that our tuxedo builder offers 88 different rental tuxedo styles, ranging from $79 to $119, and the price includes: tuxedo jacket, pants, shirt, vest or cummerbund, bowtie or longtie, formal jewelry and a garment bag to carry and protect your tuxedo. Your tuxedo arrives at your home (or anywhere you want in the USA) a full 7 days before your event. You can also upgrade any package to include any pair of shoes we carry, for just $22! Not just a rental store. Now, you can buy many of our products. All tuxedo vests, bow ties, long ties and pocket squares now have a purchase option. 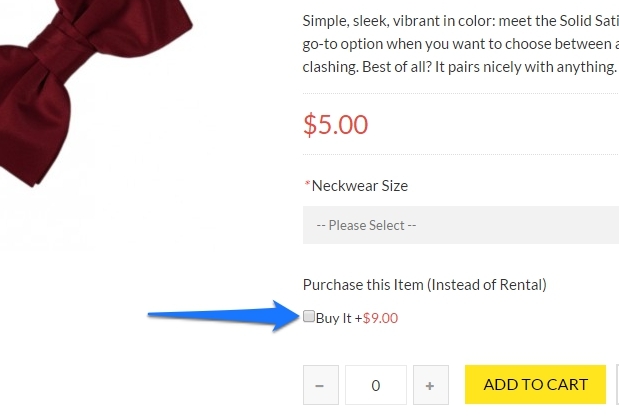 You’ll see a little checkbox on the product page, which allows you to buy the item instead of renting it. As you check the box, the price of the product will change to reflect the purchase price. Our selection to provide these new purchase options are due to high demand for the ability to purchase our accessories from our customers. If you see something you would like to buy, and it does not have a purchase option, please contact us, we can always work something out. If the demand is there, we might just roll out the ability to buy everything. For now, though – just reach out to us. Now you can chat with us any time. Last week we rolled out realtime chat with our customer service team. Right now you should have a chat widget at the bottom of your screen. Click the red tab to chat with our support staff any time. It’s been great talking to everyone, and we’re standing by to help you! Our tuxedo builder now lets you customize your pants option with your tuxedo. So, if you want a white tux jacket, but feel like mixing it up with black pants – you can now do that. You can do a lot of neat things to mix up your look, but sometimes you may want to request something that our tuxedo builder doesnt directly empower you to do. There’s a workaround for that – use the comments box! The very last step of the tux builder has a comments box. Use that box to specify your wishes, maybe you want a different colored bowtie than your vest. If we get enough similar requests through our comments box, we will start incorporating those ideas as new features in future updates. We are working to bring some other new products to the store this week, keep an eye out for that announcement in the coming days. This article was posted on Sep 29, 2014 .